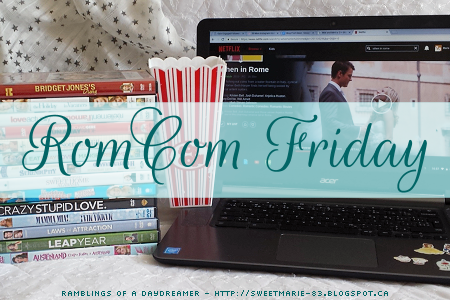 RomCom Friday is a new weekly feature here at Ramblings of a Daydreamer. I’ve always been a romantic comedy addict, and since I’m currently writing a romcom, I thought it would be fun to feature a favourite romantic comedy every week and talk about why I love it. Please note, there will be spoilers for each movie. I started my RomCom Friday feature last week with what is probably my all-time favourite romantic comedy movie: Bridget Jones’s Diary. This week I’m featuring another top favourite: Notting Hill. In the next few weeks, you’ll likely notice I have a particular fondness for British movies and certain actors (whether British or not, but in this case, since I'm featuring two movies in a row with Hugh Grant, you can see there's going to be a pattern here!). Notting Hill, starring Julia Roberts and Hugh Grant encompasses so many aspects of what makes a romcom great: a fantastic cast (like with Bridget Jones’s Diary, you get a wonderfully eccentric and eclectic group of friends who you come to love and root for as much as the main characters), hilarious scenes and dialogue, a romance to root for, and countless quotable lines. One of the things I love about Notting Hill is how it’s completely different from everything else Julia Roberts and Hugh Grant (two of my favourite actors, by the way) have done in their careers. The role of Anna Scott is an interesting choice Julia Roberts because the character is quite subdued and understated. I’m used to seeing Roberts in roles where she’s a lot more expressive and quirky. Anna is a bit jaded by Hollywood and wary of who she lets into her life. She’s used to dealing with fans, the paparazzi spreading rumours and taking unflattering pictures, and she’s been forced to try to remain to look young in order to keep her job. Her romances have been with fellow celebrities who know what the Hollywood lifestyle encompasses, so meeting and developing feelings for William really threw her for a loop. Hugh Grant as William Thacker, the bumbling, floppy-haired travel bookshop owner is just about the cutest thing ever. Grant tends to be cast as the insufferable jackass who says and does the wrong thing, offends at every turn, and yet still manages to somehow be charming. In Notting Hill, he’s purely charming. Not only are the roles different for Roberts and Grant, the movie itself is refreshingly different; the majority of celebrity-falls-for-normal-person movies and books I’ve encountered feature a famous guy and a ‘regular’ girl, so Notting Hill is a fun spin on that. I also like how they portray the passage of time (the scene where Grant walks down Portobello Road in Notting Hill with the seasons and people changing all around him while ‘Ain’t No Sunshine’ plays is a clever way to show time passing, unlike a lot of other movies that just skip ahead and expect you to keep up) and that things weren’t easy or immediate for Anna and William. 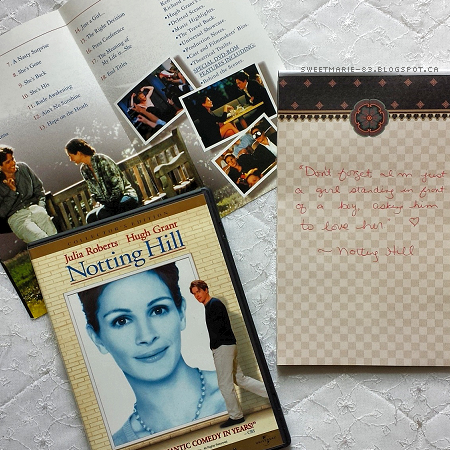 For me, Notting Hill is a quintessential feel-good movie. It’s always made me run the gamut of emotions - even 18 years later (god, that makes me feel old!) I still giggle and get teary at all the same parts. I’d love to have a group of friends like William’s (I’d pass on a roommate like Spike, although you'd never be bored having him as a friend). This is one of those movies that seems to have an almost cult-like following, with people who will hear something like ‘whoopsidaisies’ or ‘love isn’t love without a violin-playing goat’ and know immediately not only what movie it’s from, but also the exact scene and what was happening. Side note: there aren't many songs on it, but I love the Notting Hill soundtrack. To this day, I can't hear She by Elvis Costello, Ain't No Sunshine by Bill Withers, or When You Say Nothing At All by Ronan Keating without thinking of Notting Hill (and knowing exactly what scenes they're from). Do you like Notting Hill? Who's your favourite character? Do you have a favourite quote? Have you been to Notting Hill? I've wanted to go since the first time I saw this movie and was so excited to finally venture there two years ago when I went to London, but we just didn't have time. Next time! I love this movie, though it's been forever since I've seen it. I always remember the part where Spike is eating mayonnaise and thinks it yogurt. And when he finds out he just keeps eating. Always made me cringe but laugh. I think it's time for a rewatch.